MCHA's primary goal is to educate our students with innovative technologies and techniques in food preparation and services. MCHA's program is designed to meet the career goals of diverse population. MCHA courses are structured to develop and equip our students with relevant skills, knowledge, and expertise necessary to become globally competitive industry practitioners. Manila Culinary and Hospitality Academy offers both Diploma In Culinary Arts (1 year) and Short Courses. 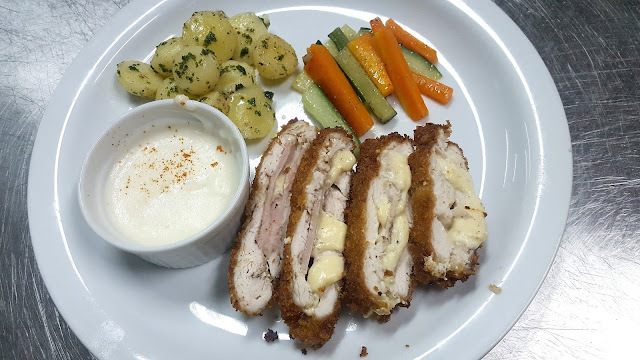 Diploma In Culinary Arts (Cookery NC II and Bread & Pastry Production NC II) program covers 2 fundamental TESDA qualifications which are Cookery NCII and Bread and Pastry Production NCII. 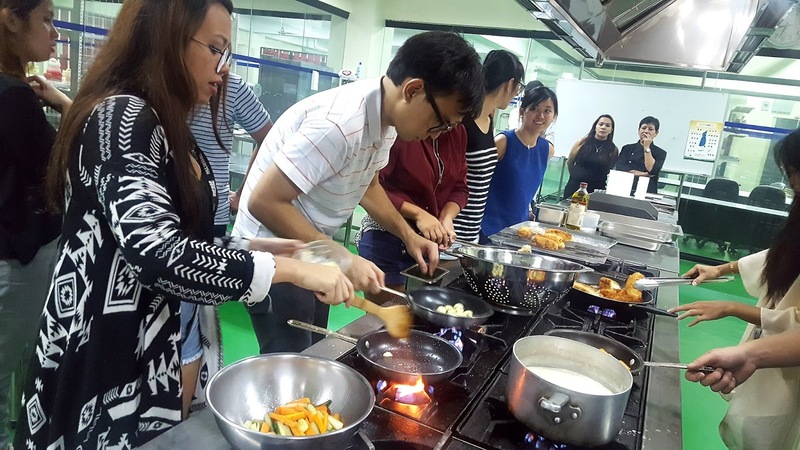 The hands-on learning experiences and in-depth knowledge gained from the program will prepare the students for the grueling world of the food service industry. The students will spend 7 months training in the school and another 5 months on the job training at hotels or restaurants. Short Courses include Culinary Arts Fundamentals (60 hours) and Pastry Arts Fundamentals. Culinary Arts Fundamentals is designed to introduce the students to the fundamentals of cooking and food preparation. 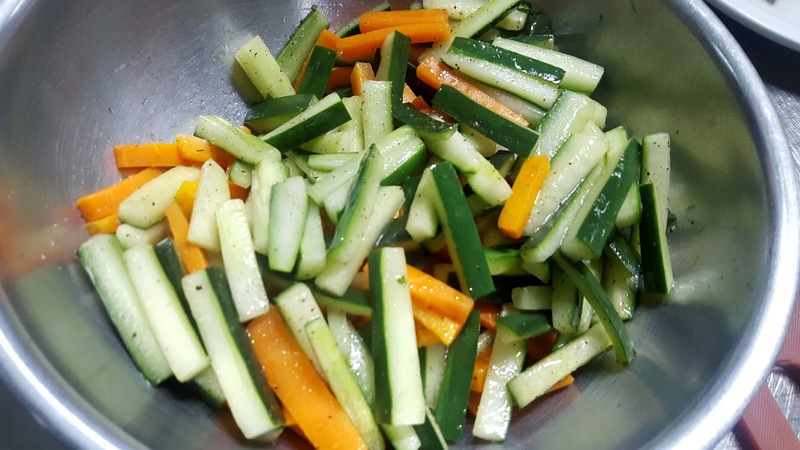 It aims to provide students with necessary skills to produce a wide range of high quality food items from appetizers, salads, soups, main courses, and even plate presentation. The The Pastry Arts Fundamentals program is a comprehensive short course program that will give the students the opportunity to learn the principles and basic techniques in pastry arts, bread production, and confectionery. 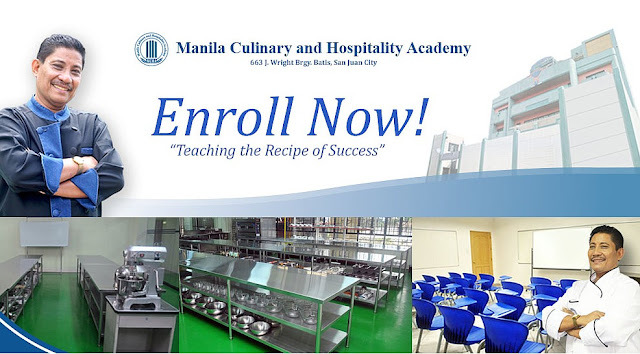 Manila Culinary and Hospitality Academy has its own world-class facilities; the building has large rooms that house their equally huge kitchens, class rooms, function halls and training areas. All the ingredients, cooking wares, glassware are readily available for all the students of the academy. Our "very" short course started with a one hour lecture facilitated by Chef Fats. Of course we cannot cover all that is necessary to know for someone to become a chef, so she picked the topic "Cooking methods" to discuss to our class of 15 bloggers. Most people don't know that there are alot of cooking methods like Grilling, Roasting, Baking, Braising, Steaming, Simmering, Boiling etc. And each cooking method requires the right amount of temperature. You just don't cook and properly choosing what method of cooking delivers great tasting food. One will also notice the difference between food cooked in the right cooking method and temperature compared to what we usually know. The second part of the course composed of us bloggers cooking our own gourmet dishes from scratch! Yes no pre-done ingredients here, we peeled, chopped and sliced our own veggies and meats. Even the sauces were done from scratch and did not come a sachet. We were divided in several groups and each group would prepare all 4 dishes. Our gourmet dish for the night included: Cordon Bleu, Buttered Veggies, Bechamel Sauce and Buttered Parsely Potatoes. Making of Buttered Parsely Potato I was grouped with two male bloggers and the 3 of us made a good team! We prepared the potatoes from scratch, balled them using a watermelon baller; yes they are not baby potatoes. We chopped the parsley, boiled the potatoes and sauteed them. 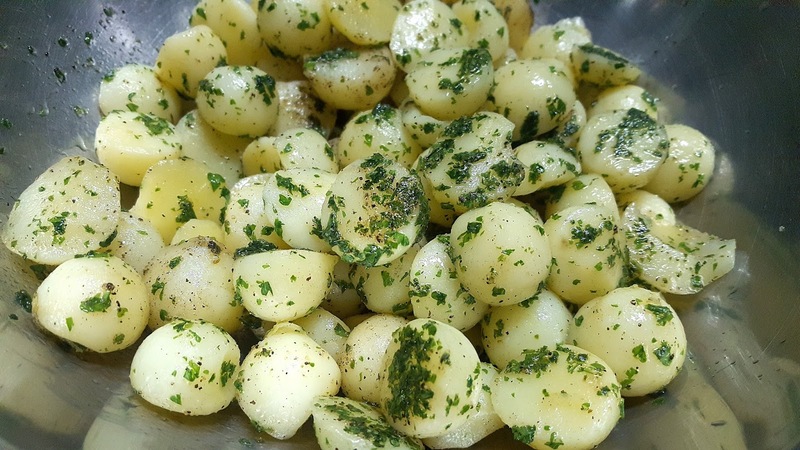 We just followed the recipe given to us and I am proud to say we did great and our potatoes were awesome! Hahaha! After everything was done, Chef Fats plated the dishes. Even the plating has its own methodology. 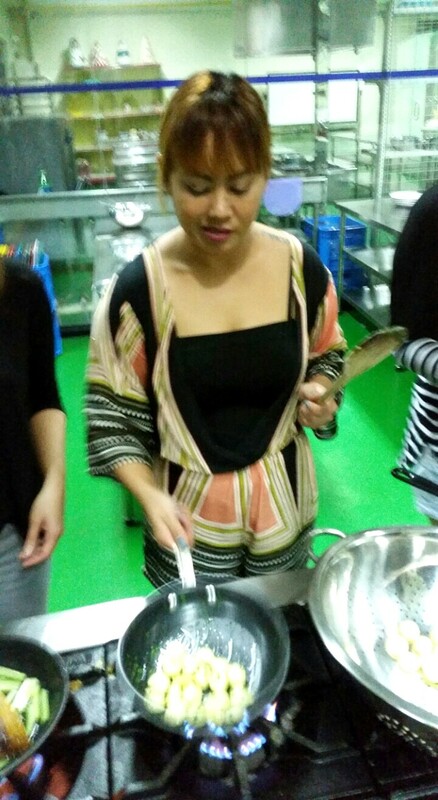 She then instructed us to plate our own dinner. Everyone got creative with their own plating as well. After proudly taking photos of our finished products we enjoyed the gourmet dinner that we all prepared, and we couldn't be anymore proud of ourselves! It was a great night with my fellow bloggers who all love good food and who also have found their new love and appreciation for cooking. 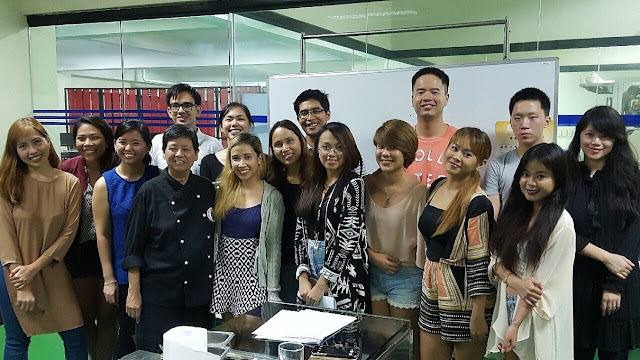 We would like to thank Aldous (of aldousatetheworld.com) for organizing this event, Mr. Kenneth Hung, Chef Fats and the staff of Manila Culinary and Hospitality Academy for this great experience. I definitely learned a lot even though it was a just a very short course. If you guys are interested to study culinary or want to take short culinary courses, you can contact Manila Culinary and Hospitality Academy, I've written their details down below. Everything is so perfect from the title down to the very last word.